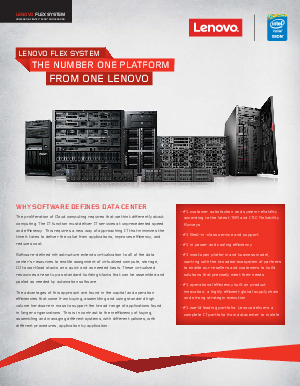 Lenovo® Flex System™ — powered by Intel® Xeon® processors — is the newest blade infrastructure design with the attributes that support soft ware-defi ned infrastructure and virtualization better than any competitor. Reduces capital and operational costs with consistent hardware/software deployment and the ability to simply scale workloads with the highest VM capacity and performance. Increases agility with simplified rapid deployment and ongoing management to add, change, or move workloads with their associated resources. Improves efficiency and increases space, power, and cooling with the leading compute, storage, and network density.